Greetings and salutations, everyone; yes, once again it is I, Mani the roasting hot purebred border collie, filling in for the guy and live with, and here to bring you a brief post showing how not only super roasting, but beyond super roasting it’s been lately. You may remember me from such other hot posts as “Super Roasting”, among at least a few others. Here I am in a characteristically demure and thoughtful pose. It’s been really hot. 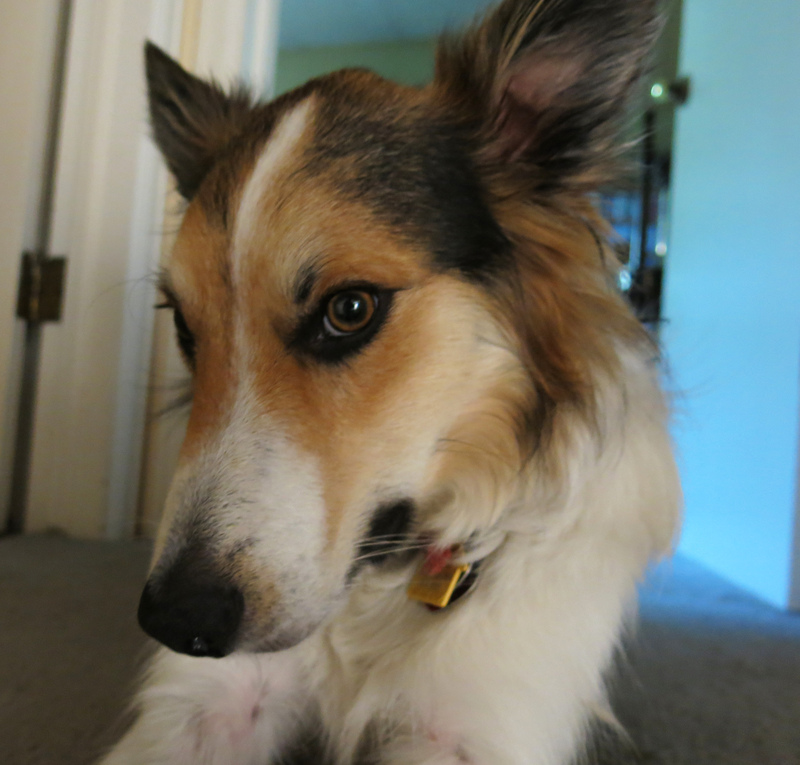 As you may know, we purebred border collies dislike hot weather intensely, and so I’ve been suffering quite a bit. I keep trying to tell the guy I live with that maybe an air conditioner might be a good idea. We still don’t have one, and the guy I live with says that if I wait a few months, the weather might not be so unbearably awful. Yesterday it was ninety-eight degrees Fahrenheit (37C), with six percent humidity, and wind, and I thought I was just going to shrivel up into some dried husk and be blown away. Hardly any gardening has been going on, though I understand some might take place later this week. I’ll let you know if it does. The guy I live with said that two summers ago, it was nothing but endless thunderstorms, sometimes lasting all day and into the night, and only ten days without a storm, so maybe this is slightly better. I don’t know. Meanwhile, I figured out what to do with the pool that showed up here a while ago. The guy I live with posted a picture of me on Facebook a couple of days ago, but this is an even better picture, as I’m sure you’ll agree. When it’s this super roasting hot, even beyond super roasting, this is what you do. From where I am sitting right now beyond super roasting doesn’t seem a to bad an option! But maybe just for a little while and then switch it off. Great photo in the pool. Regretably not too much out of doors action here but the snowdrops don’t seem to mind. I hear it’s raining and maybe even snowing Down Under. Snow sounds very nice after all this heat, and no rain. Well, not snow now, but later, here. Oh well, it’s all relative I guess. Have Spindlestone Surprise, Rodmarten, Kite and Lady Beatrix Stanley, to name a few, going beautifully despite the weather. Guess these plants are kinda weather-proof. I think it is all relative, since snow sounds pretty good to me right now. (The guy I live with says it would be very bad for the plants, though.) We’ve noticed that snowdrops are weatherproof here, which is one reason why we like them. Well, the guy I live with does, anyway. I love the way you keep yourself hydrated, Mani. With that last photo of you in your cool blue pool you have broken the cuteness meter. In the words of Nigel Tufnel, you’ve gone all the way to eleven. Thanks; I guess I would have to agree about the cuteness, though I hear that’s immodest. The guy I live with says it’s going to be roasting hot here for a long time. ” ninety-eight degrees Fahrenheit (37C), with six percent humidity”….. perfect swamp cooler weather. Yes, except that it raises the humidity in the house. Mani! This photo of you in the pool is fantastic! The lighting, the composition, the eye contact… Do you think the guy you live with would ever loan you out to gardeners without a dog? I like to chase squirrels–a lot–and the guy I live with says that if I showed up in your garden you wouldn’t have a garden for very much longer. He says that even though we purebred border collies are, you know, border collies, it takes a few years for us to recognize the concept of boundaries. I like to crash through the shrubbery, and things like that. Mani, You have my total sympathy regarding the heat, my dog would second the idea but she is finding a more relatively cool spot in the house. 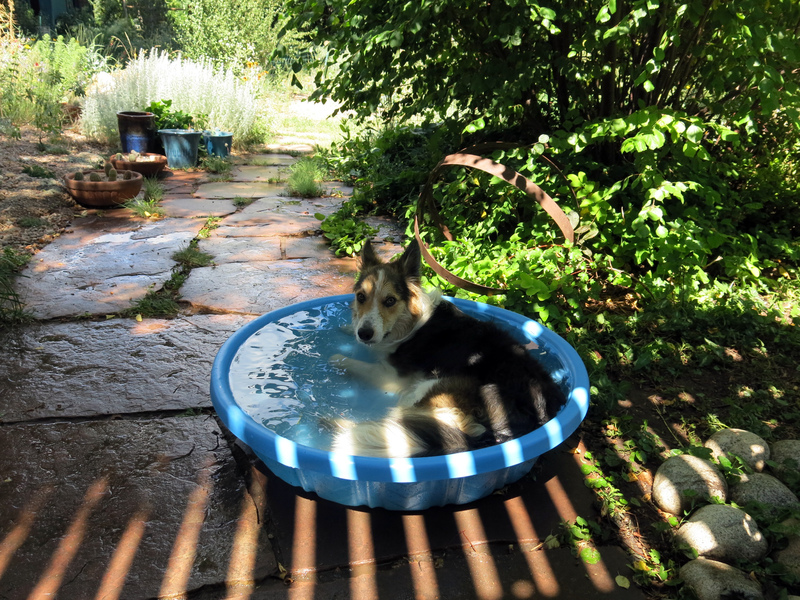 It is very thoughtful you have a wading pool but let’s face it, that’s not air conditioning. Suggest to that fellow (who seems to control the decision making) if an air conditioner is not in the cards, you would settle for a swimming pool. That would be much bigger than your wading pool an something he could enjoy as well. You will enjoy the look on his face when you bring this up. Oh, Mani, I take time out from watching the Tour de France on telly to inform you that your cuteness is Beyond Category, which is what they say when measurements fail on le tour. Yes, you are Beyond Category, way straight high up in the Pyrenees (where you wouldn’t necessarily be cooler). And you not even a Pyrenees Mountain Dog but an excellent purebred Beyond Category roasting hot Border Collie. Also, quelle horreur, you are required to live *sans* conditioned air even though the guy you live with assures you that the whole summer will be more of the same beating heat. Quelle dommage, pauvre chien. Lounge on in your pool. Thanks; I was just lying in it a few minutes ago. The guy I live said “Huh-uh”, when I got out and strolled into the kitchen. He says he did shop for air conditioners, window-type, but that this really isn’t the season for them. It’s extremely cool and nice downstairs, anyway, and that’s where we take our afternoon naps, with the fan on, of course. Indeed. This weather seems hot enough for me, that’s for sure. It cooled off today, a little.